Hello again Bif Bang Pow! fans, and Dexter admirers. I have some exciting news to share with all of you, and it's just in time for the holidays. Remember waaaay back to San Diego Comic Con, July of '08? 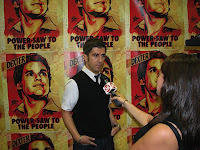 Think back if you can, of the super cool 'Dexter' campaign that our friends at Showtime came up with. Everywhere you looked down there (including the Entertainment Earth booth), you seemed to see the Shepard Fairey poster of Dexter Morgan. And because of that, we had hundreds of fans coming up to us asking where they could get their hands on one of the beauties. Well, the wait is over. Never let it be said that Bif Bang Pow! doesn't give the fans what they want. Head over to Entertainment Earth right now, because a limited edition poster SIGNED by Shepard Fairey is available right now! This piece of art is extremely limited, and won't be available for long, so I suggest you put down the power tools, take off the rubber gloves and get ordering! I can't guarantee you'll look as cool as the fellow in this picture with your poster pinned up behind you, but you can try. Power Saw to the people, people.